With the greening of the trees, comes the arrival of one of our most colourful and distinctive birds, the American Goldfinch. The male is bright yellow with black forehead, wings and tail. The beak is pink. The female is quite differently clad in greenish yellow, like a pale, washed-out version of the male. The only bird it could be confused with is the unrelated Yellow Warbler, but the warbler has no black at all. 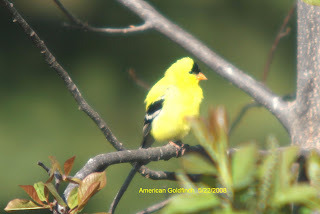 Some people have expressed a little concern over the name American Goldfinch because of the implication that it is a bird of the United States only. There is a bird in Europe, commonly caged, that is simply called a Goldfinch. It is related to our bird, but is quite different in appearance. Because the European bird was named first, our bird had the name American added to it. In fact, this system has been applied to some other birds in North America. The European Goldfinch no longer exists in North America, so I use the word “Goldfinch” only, when I refer to the American Goldfinch. There is no chance of a mix up. Attracting Goldfinches to your backyard is very easy. Just put out some feeders filled with oilseed (sunflower) and/or black thistle seed and the birds will come. Once nesting starts, activity at feeders declines drastically as the adults are too busy feeding their young. Because baby birds are incapable of digesting seeds, they must be fed insects until they reach maturity. This is true for most birds. At this time of year, most birds have paired off and are actively building nests in preparation to raising their young. Goldfinches are an exception. They start nesting about the middle of June and raising their young until the end of July. 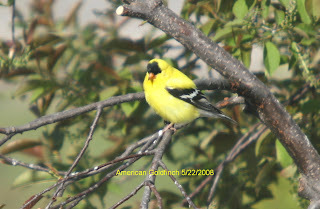 Even though Goldfinches are quite tame and readily visit backyard feeders, they will seldom nest near man. They are, also, unusual in that they nest fairly high up in trees. Abandoned farm yards, poplar bluffs and riparian woods (trees along waterways) are favoured nesting sites. For those of us who live in town, it appears that the birds have gone away for the summer; for those who live on farms, they are present all summer long. What makes a finch a “finch” and not, for example, a sparrow? There are several distinctions, but two that stand out. First, unlike sparrows, males and females are quite differently coloured from each other. Second, sparrows fly in level flight, (which is true for most birds), while finches fly in shallow arcs or undulating flight. The only other birds around here that have the same flight pattern are woodpeckers. The biggest problem with being a Goldfinch (or even a Yellow warbler) is that people tend to call all small yellow birds Canaries. I cannot emphasize this enough – there are no wild Canaries in the New World. In fact, the only place where they can be found in the wild is in the Canary (no surprise, here) and Madeira Islands off the coast of Africa.. In the wild they are brown with greenish yellow undertones. Through selective breeding, bird breeders were able to eliminate the browns and greens leaving only the familiar “canary” yellow. Why? Yellow birds are more desirable in the caged bird trade and fetch a higher price. It is simply a matter of human taste. All Canaries sold in pet stores are bred in captivity. However, Canaries are finches and their song does resemble that of our Goldfinch. To my knowledge, the American Goldfinch has never been used in the caged bird trade. Enjoy these birds for the next two weeks, or so.